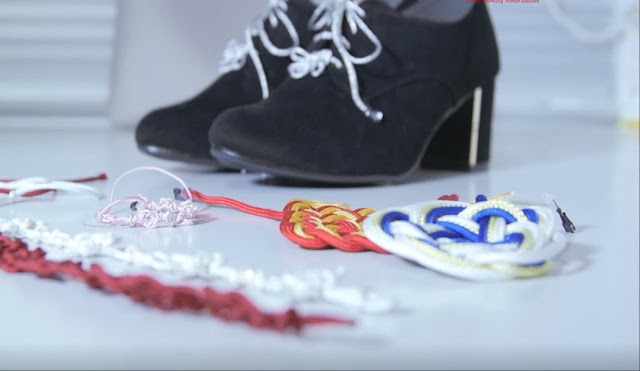 Yoshiro Tajitsu of Kansai University, Osaka, Japan, and Teijin Limited, Japan, have developed innovative wearable piezoelectric PLLA braided cord sensors. This technology can be used as wearable sensors in the fields of fashion, sports apparel, interior design, and healthcare, areas for which conventional wearable sensing devices cannot be used. Touch panel displays are ubiquitous. It is difficult to imagine using smartphones, personal computers, digital watches, and other modern electronic devices without this form of human-device interface. However, despite the proliferation of touch panel devices there is increasing research on the next generation of ‘man-machine’ devices, which could be worn like clothes, so called ‘wearable sensors’. Now, in an innovative approach, Yoshiro Tajitsu of Kansai University, Osaka, Japan, and Teijin Limited, Japan, have developed the world’s first wearable piezoelectric fabrics consisting of a conducting carbon fiber yarn core; piezoelectric polyctric poly-L-lactic acid (PLLA) fiber yarn and polyethylene terephthalate (PET) middle sheath; and conducting carbon fiber outer shield (Fig.1). The piezoelectric PLLA braided cords produce electrical signals in response to almost any type of three-dimensional motion, including bending and twisting. Importantly, these coaxial cable type fabrics are woven into piezoelectric braided cords for electromagnetic shielding and high sensitivity, so they will not respond to environmental noise from cells phones and other such electromagnetic interference. Fig.2. 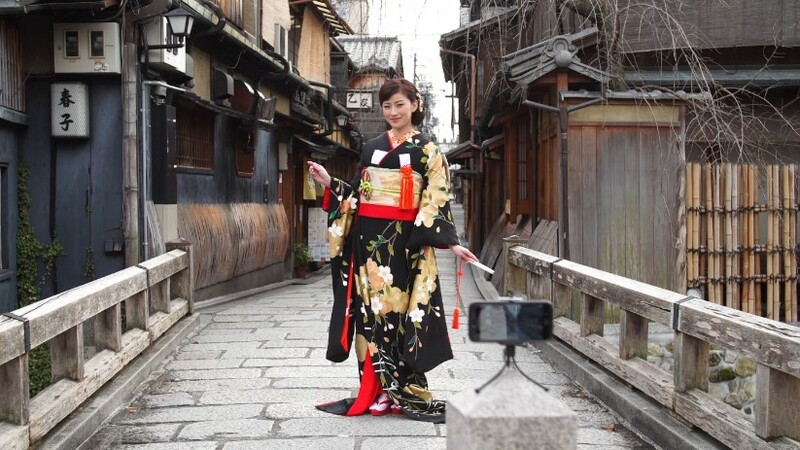 Taking a selfie with ‘e-textiles’: Traditional Japanese Kimono. 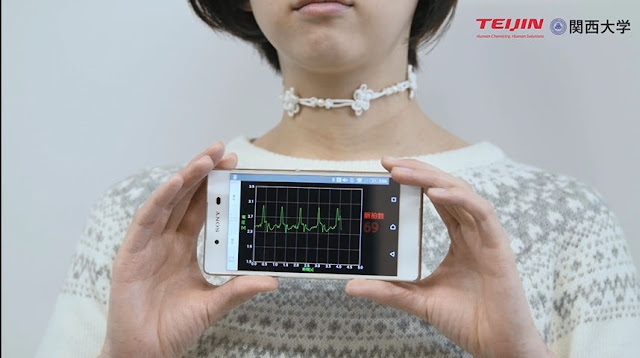 One of the unique wearable applications is for Japanese Kimono’s (Fig.2), for example to trigger a smart phone to take a selfie. “We are working with fashion designers in France and Italy of the design of clothes made with our PLLA braided cords,” says Tajistu. “We are looking into possibilities for traditional Japanese clothing like women’s Kimono with partners in Japan.” The piezoelectric PLLA braided cord can be used as wearable sensors, mainly in the fields of fashion, sports apparel, interior design, and healthcare, by utilizing its fashionability and wearability, which cannot be achieved using conventional wearable sensing devices (Fig.3). Fig.3. 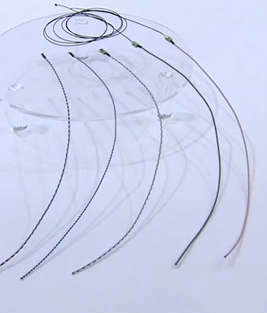 Fashionable sensors fabricated using piezoelectric PLLA braided cord. Fig. 4 Pulse wave signal described in the text. 3) Y. Tajitsu, “Piezoelectric Poly-L-lactic Acid Fabric and its Application to Control of Humanoid Robot”, Y. Tajitsu, Ferroelectric, 515, 1 (2017). 4) Y. Tajitsu, IEEE Transactions on Dielectrics and Electrical Insulation, in press.